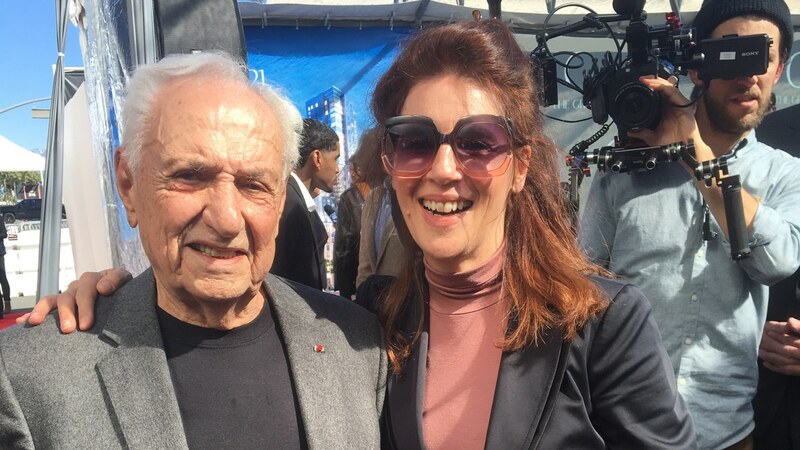 Frank Gehry with Frances Anderton at the groundbreaking of The Grand. Photo by Avishay Artsy. Buildings are complicated and costly and many architects don’t hit their stride until their forties or fifties. But even these late starters wind down as they age. Not so Frank Gehry. He turns 90 on February 28 -- and he’s nowhere near slowing down. He marked this milestone with the groundbreaking this month of The Grand, the long-awaited shopping and entertainment destination being built opposite the Walt Disney Concert Hall. He is working on skyscrapers in Toronto, an arts center in Arles, in France, and he is in conversation about designing a concert hall in the London borough of Wimbledon. He will celebrate his birthday in Berlin, at the Pierre Boulez Saal, an auditorium and musical academy completed 2017 that grew out of a collaboration between the Jewish pianist and conductor Daniel Barenboim and the Palestinian intellectual Edward Said. Gehry has made some changes in his firm to acknowledge the march of time, like creating a next generation of partners. But generally he is focused on the work. DnA takes a look back -- and forward -- at Frank’s career, in a conversation peppered with zingers and anecdotes. We learn about how much LA shaped his architecture -- back then, “it was wide open spaces. I don't think there was a lot of context to worry about” -- and a little more about The Grand. Frank Gehry talks about The Grand in his studio and in conversation with Frances Anderton at the Redcat. Courtesy Altimeter Films and Related Companies. We learn that his connection to Bunker Hill goes back a very long time: "When I first came to L.A. one of my jobs was at a jewelry store on 3rd Street and I took the Angels Flight to work." I first met Gehry in the late 1980s. That was a decade when many architects were feeling Modernism had become moribund. Many architects went back in time for inspiration, to classical buildings, and created what became known as postmodernist architecture. Gehry was interested in warmth and decoration too, but not through pastiche, and the new language he created was immensely inspiring to me and a generation of young architects -- from early experiments in cardboard furniture, fish lamps and the cubist wrapping of his Santa Monica home in chainlink and plywood through to his digitally enabled voluptuous museums and concert halls. For Gehry the highs have come with some lows. The recession in ‘08 hit him like everyone else. 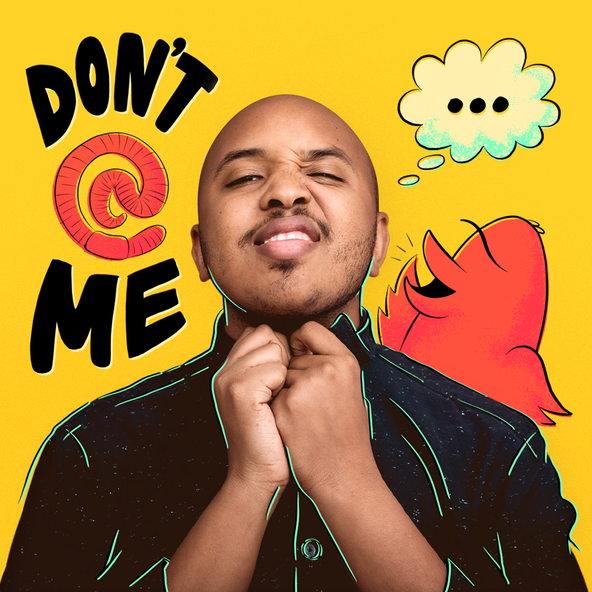 And around then he found himself the target of criticism from a new generation that labeled him a “starchitect,” gobbled up by the culture of money and stardom his talent brought him. 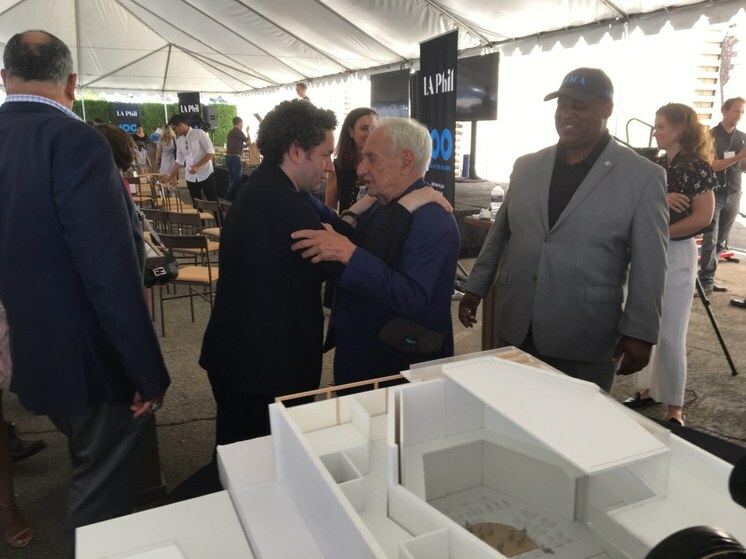 Gustavo Dudamel embraces Frank Gehry in front of a model of the new Youth Orchestra Los Angeles center, at a public unveiling in 2018. Photo by Avishay Artsy. He’s worked to diffuse that image, with projects in low-income communities like a new performance space for the Youth Orchestra Los Angeles in Inglewood, and at the river in South LA. As he enters his tenth decade, there is one thing that’s never changed for Frank: the desire to build -- at whatever scale. Clips of Frank Gehry in today’s DnA come from a conversation hosted by Related Companies at REDCAT on December 12, 2018. The event was filmed by Altimeter Films, who graciously shared the audio with us. What will it take you to give up the car? LA traffic is getting worse. So what is it going to take to get you out of your car and onto a bus or train?